For a better understanding of the CPT code set, rely on the best- selling CPT Changes 2018: An Insider's View. Find the meaning behind all of the changes noted by the symbols you've come to know within the AMA's CPT Professional Edition codebook. 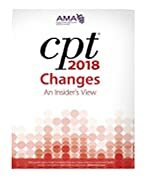 Invest in this annual publication and get the insider's perspective into the CPT code set right from the source-the American Medical Association.